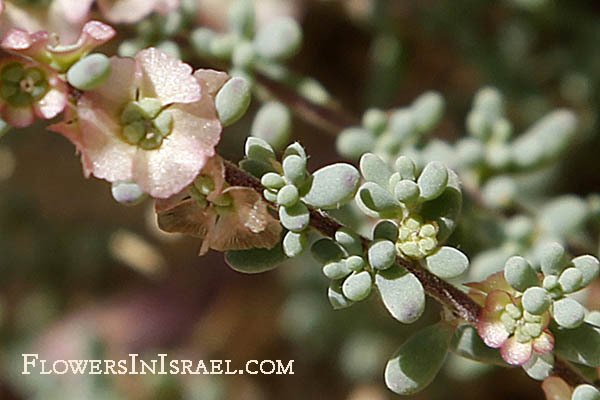 Synonym name: Kochia brevifolia R.Br. Leaves: Alternate, cylindrical or terete, scattered, fleshy, obovoid to almost threadlike, 2 – 5 mm long, narrowing into a short stalk, mostly hairless. Maireana, named for Charles Antoine Lemaire (1800 - 1871), was a French botanist and botanical author, noted for his publications on Cactaceae. 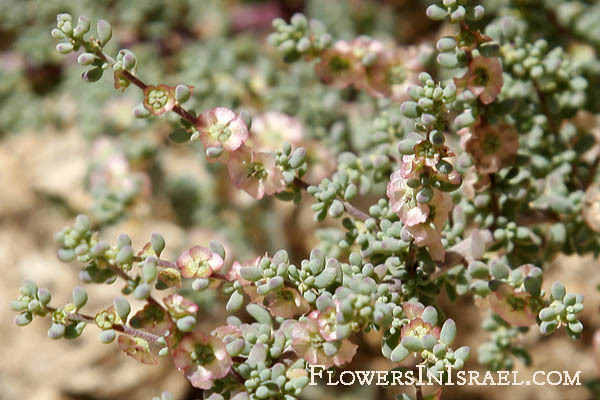 Kochia, named for Wilhem Daniel Josef Koch (1771 - 1849), a German physician and botanist, Professor of Botany at the University of Erlangen Nuremberg. The standard author abbreviation (R.Br.) is used to indicate Robert Brown (1773 – 1858), a Scottish botanist. The standard author abbreviation Paul G.Wilson is used to indicate Paul Graham Wilson (born 1928 in Tzaneen in the Transvaal), an Australian botanist. His areas of expertise include the hash plants (Rutaceae) and goosefoot (Chenopodiaceae), the latter being present as the Amaranth family (Amaranthaceae) duly considered. The species is "new to" the Flora Palaestina area. 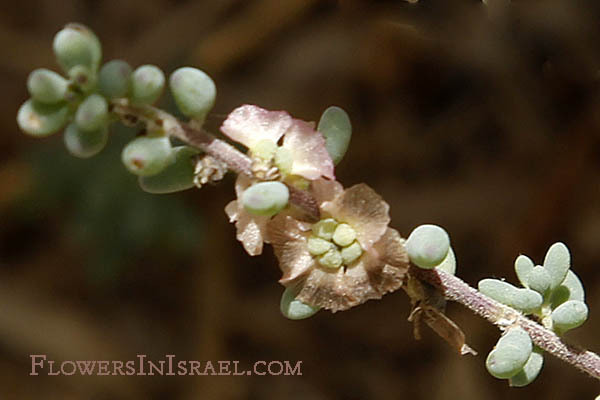 It was first introduced in 1948 and is naturalized in the Negev desert.